If you have ever wanted to make money online, and haven’t yet heard of Fiverr, you NEED to head over there now. 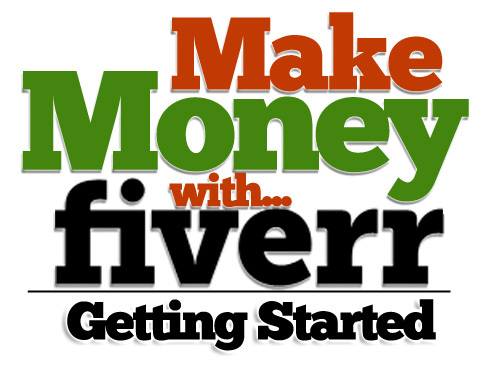 How exactly can you make money on Fiverr? That’s like asking how can you prepare a chicken dinner. That’s not the best example, but hey, I’m just writing whatever comes to mind. The point is, there are countless ways to make money on Fiverr. I discovered this gem of a web site a little over a year ago, and I bought all my family’s Christmas presents from there. I was definitely on a budget, and the $5 Fiverr gigs as gifts actually turned out to be a hit. Everyone in my family loved them. 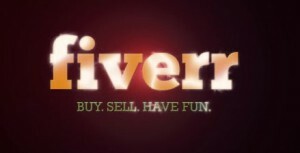 But what is Fiverr, and more importantly, how can you make money with Fiverr? Well, here’s my Fiverr review with the answers to those questions. Fiverr is a place where you buy goods and sell goods. Each gig costs $5, which is where the “Five” in Fiverr comes from :). I’m guessing you want to figure out how to make money on Fiverr. Well, it’s as simple as choosing a passion that you have, and choosing to make money with it. Earlier this year when I was flat broke, I set up a gig on Fiverr as a songwriter willing to write and record a song for you for $5. If you want to check out that gig, here’s the link. I think it’ll give you a very good understanding of how money can be made on Fiverr. 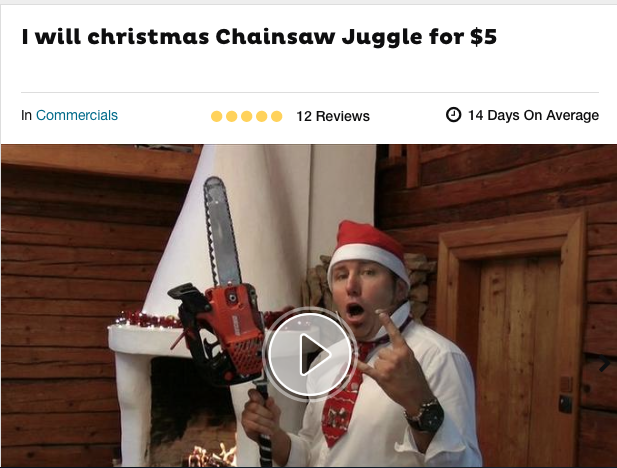 I hope you see just HOW weird things can get on Fiverr. It doesn’t have to be music related. Are you a painter? A chef? 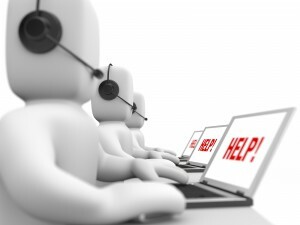 A virtual assistant? An SEO geek? A blogger? A DJ? A Rubik’s cube master? A magician? A slob? A ventriloquist? A bird? A plane? A bee? If you consider yourself talented at ANYTHING, you can make some awesome money on Fiverr. You can sell ANYTHING…if you wanted to sell a booger, you probably could. You can make a full time living on Fiverr if you promote your gigs properly. It has TONS of traffic and is the 174th most visited site in the WORLD. People are willing to buy a $5 gig, so your likelihood of earning money is high. You can add “gig extras” to your gig. “For an extra $5, I will ALSO do this for you”. As a songwriter, I’ve added an additional instrument to a song for $5. For an additional $10, I record the song with studio quality microphones. Think about how you can use this concept with whatever gigs you choose to create. Once you develop a good reputation with buyers, they will come back to buy more. The more positive reviews you get, the higher your ranking is on Fiverr, and the more people become exposed to your gig. Unless you have something really unique to offer, you’ll have a lot of competition. Fiverr takes $1 for every gig you sell. They obviously need to make money too! You may deal with unsatisfied customers who want revisions, which takes up your time. It’s really up to you how you approach this. Set specific guidelines before you create a gig. The last thing you want is people leaving you bad reviews. 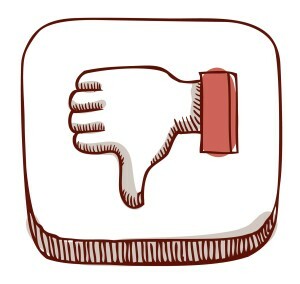 There is bad business that goes down on Fiverr. A lot of people have crappy gigs that don’t deliver. Please don’t allow yourself to become one of those people. If you have a service to offer, make it worth people’s $5, so you get a great review. Stand out from the crowd. things can get on this site. Yep, this is the chocolate syrup dude – although he was dressed as an elf when I bought it! It wasn’t long after that when I realized I needed to somehow use my talents on Fiverr. So I set up a songwriting gig. I told my drummer to set up a drumming gig. The bottom line is this – make money with your talents! I have never had trouble with Fiverr’s customer support. They have always been timely and respectful in getting back to me. All contact information is on the site, but I’ve never really had much reason to contact them, honestly. The site is laid out in such a way that the user experience is very friendly. Since 2010, when Fiverr was born, it hasn’t strayed from what its original intention was. That is to give people something of value for only $5. Yes, gigs can have extras if people want to buy add ons. You can make more money if you do that. For instance, if you’re a painter, you could create a gig where you’ll paint someone a black and white portrait for $5. Then you can sell a gig extra and mention that you will add color to the portrait for an additional $5. But at its core, every single gig on Fiverr is just $5. Fiverr is a great web site to buy some crazy cool gifts for friends, for yourself, to buy necessary tools to grow your business (which I do regularly), or to buy almost anything else you can humanly think of. It’s also a great place to make some awesome money with your own passions. Your passion can honestly be as crazy as can be, and someone would be interested in it. Read above about my fat shirtless singing elf gift :). The only thing I would caution is to do your research before you buy a gig. I HAVE purchased gigs that were crappy. I didn’t feel so bad about it, because I only spent $5. But it’s happened more than once where someone definitely under delivered and gave me something I was not expecting. So check out user ratings before making a purchase. And if you’re going to make money on Fiverr yourself, then make sure you do a good job, and deliver exactly what you say you’re going to deliver, and MORE. If you’re passionate about something, it shouldn’t feel like a job anyway, and you should be able to give people something of value for $5 that will make them come back to you for more. I hope this review helps you understand how it’s possible to make some great money on Fiverr. Those $5 really add up if you treat this like a business. You could easily promote your Fiverr business by using the tools and training that I’ve used to make money online at Wealthy Affiliate. Thank you for reading; if you have any questions or comments, please leave them below and I’ll make sure to get back to you shortly. Thanks Simon – I’m glad it was helpful. Hey John – yeah, I mean, anything you can humanly think of can be sold on Fiverr. It’s actually pretty fun when you think of it too. I have used fiverr several times for some graphic design jobs and have been very happy with their service! Your review has explained how it all works and a few things I didn’t know. 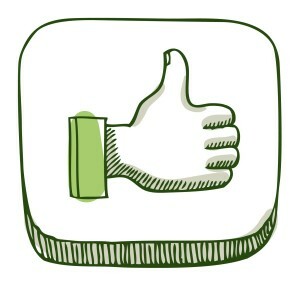 That’s great John that you’ve been happy with the service that you’ve found on Fiverr. Not all gigs are created equal. I have a guy that I hire regularly now for computer techy type work and he’s been amazing, but I had to go through a bunch of bad gigs first. I’m glad my review helped you understand Fiverr better! Thanks for the comment too. Some great facts and numbers in the review. Obviously, you did your homework and you did a thorough job of explaining Fiverr. The more you write, the more smooth it will become. I tell people all the time that with a Blog you become a writer. Good luck to you and keep the site growing. Hey there – thank you for your comment! Yeah, I agree with you that the more you write, the smoother it gets! It’s gotta be natural. Hey Jennifer! Thank you for the comment! Yeah, some of the gigs on Fiverr are seriously hilarious, but it’s really cool to know that you can pretty much sell any service, no matter how crazy it is, and make some money off of it. I have made purchases before and experienced some small successes, and making money from Fiverr is something I may consider for the future. Hey there Neil – yep, it’s an awesome way to make some nice money online. I’ve made a lot of purchases on there as well but finally one day decided to also sell some services, and it’s been pretty nice. Thank you for your comment. Thanks! Fiverr is definitely a place where you’ll find stuff that you never would have thought of!